One of my duties here at NEXTFLY is to manage the social media accounts for NEXTFLY and our clients. When people hear that social media is part of my job, they automatically assume that means I spend my days just sitting on Facebook and Twitter watching cat videos; but they couldn’t be more wrong. And while yes, I do spend some time on the actual platforms, engaging with followers and building an audience, most of my time is spent out on the actual Internet, looking for content to share. When I’m looking for content to share, whether it’s posting something on Facebook, tweeting a link on Twitter, or even repining something on Pinterest, I have the responsibility to only post credible and worthwhile content. When I post on social media, I’m acting as the voice for our brand. What I share to their followers has to be in line with the company I’m representing. I’ve listed what I take into consideration before posting and sharing content on social media. The type of content I share depends on the platform and the company I’m posting for; each social media platform has a different type of user, which affects what we choose to share. • Solves a problem- is this something that could help our followers? • Industry news- is there a new technology our followers should be aware of? • Local news- we’re proud to be based in Indianapolis and love sharing exciting Indy news. • Entertaining- is this something funny that our followers will appreciate? NEXTFLY uses our Twitter account to share web design trends, SEO updates, and general industry news. When I tweet a link to an article or a blog post, I make sure it’s up to date content that our followers may find interesting/useful. But it’s different for all of our social media platforms. There’s a lot of content I tweet that I wouldn’t share on our Facebook page. There’s a different audience, who’s using the platform for a different reason. 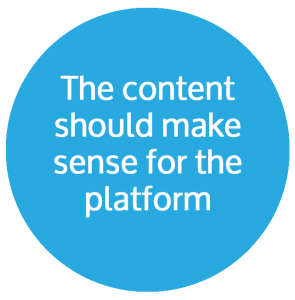 The key to sharing great content on social media is determining how you want to use that platform for your business and what kind of content will achieve those goals. What you might be okay to share on your personal social media account might not be okay to share on the company’s profile. The source of content is almost as important as the source itself. It gives your followers insight on where you’re getting the information. Here’s an example on how I take into consideration the source before sharing something on social media. Let’s say two people tweet the same fact about mobile websites that I want to retweet on NEXTFLY’s Twitter. Person A has 98 followers and has no background in mobile marketing or website design. Person B has 3,000 followers and is the CEO of a web design firm that specializes in mobile optimization. I’m going to retweet Person B. Not only am I sharing his/her tweet with our followers, I’m exposing them to the source. If I were to share content from a source that wasn’t credible, it could reflect poorly on our brand. And of course, my favorite source for content is NEXTFLY! One of the greatest benefits of social media is that it helps build trust between a brand and the public. Sharing from credible sources helps you build a reputation as someone who shares valuable information. I almost always use the advance search tools to adjust the time range for my search results. Depending on the subject, it varies between “past month” and “past year.” This helps me find content that’s been published recently and is more relevant to our audience right now. Outdated content doesn’t help anyone. Topics like SEO techniques and web design are constantly changing, so tweeting a link to a post from 2011 is of no use to our followers. In fact, it could even hurt our reputation. Occasionally I’ll dig into the NEXTFLY archives and find a great piece that I want to share again. In the past, my coworker wrote a great blog about making social media profiles look festive for the holiday season, so you can imagine that’s going to be shared again this year! The NEXTFLY team wrote a blog together about our opinions on the iOS8 release and its new features. As more updates are released for the operating system, our blog is being outdated, so I probably won’t share the post again. That’s just how the Internet works. However, if we were to update the blog, or write a new review for new features of the operating system, that would be reason for sharing the blog again. It all comes down to the actual content itself. Some content can withstand the test of time and can be shared again, but some can’t. 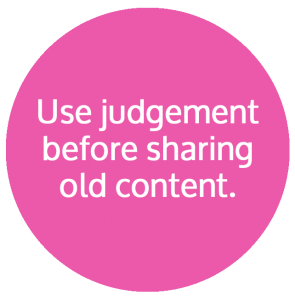 There’s no magical formula to determine when content is too old to be shared, it’s up to the social media manager to use their judgment to make that call. Keep in mind, social media for businesses is a marketing tactic, and it should be treated as such. It’s not something you shouldn’t just pass off to an employee without direction. Social media needs a strategy to be successful in meeting goals. No matter if you’re using social media for lead generation, engaging your audience, building a community, or whatever you choose, there’s more than just creating and sharing content. Certain aspects such as the source of content, the timeliness of content, and the content itself can affect the effectiveness of your social media campaign, and the reputation of your brand.